Creative background music perfect for working, studying, meditation, creativity and entertaining. Original Piano Solos, from Sound Feelings, is a set of eight pieces actually intended to be music for background. This instrumental new-age music is not too ambient that it puts you to sleep, nor is it too driven that it distracts you from whatever you are doing. This balance helps to assist creativity and the focusing process. This beautiful music is different than the healing music offered by Sound Feelings in that it does not follow the entrainment process. THIS IS NEW AGE MUSIC FOR CREATIVITY AND MEDITATION. NEW-AGE MUSIC AND MEDITATING OR BACKGROUND MUSIC. PLEASE COMPARE TO AMBIENT OR AMBIENCE MUSIC RELAXATION. THIS IS RELAXING MUSIC FOR STUDYING, WORKING, FOCUSING AND CREATIVE CREATING. ORIGINAL PIANO SOLOS IS AN INSTRUMENTALS USING PIANOS SOUNDS ON TAPES WITH TRANSFORMATIONAL MUSIC, FROM HOWARD RICHMAN AT SOUND FEELINGS. 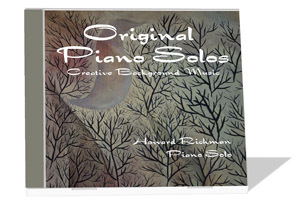 Original Piano Solos: Creative Background Music. See the Uses and Applications for Original Piano Solos. Available INSTANTLY. After you make your payment, you will be given a password which will allow you to download the .mp3 or FLAC version of Original Piano Solos. You will then be able to hear the complete title on your computer. If you prefer, you may use your CD burner on your computer to burn a CD of each track, which you then will be able to play on any CD player. 11 free tips to improve studying results. 11 helpful free tips show how to listen to music for transformation and healing. Also, please see our links to other great sites about creativity, learning aids and sound healing.